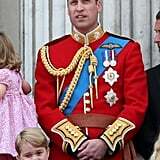 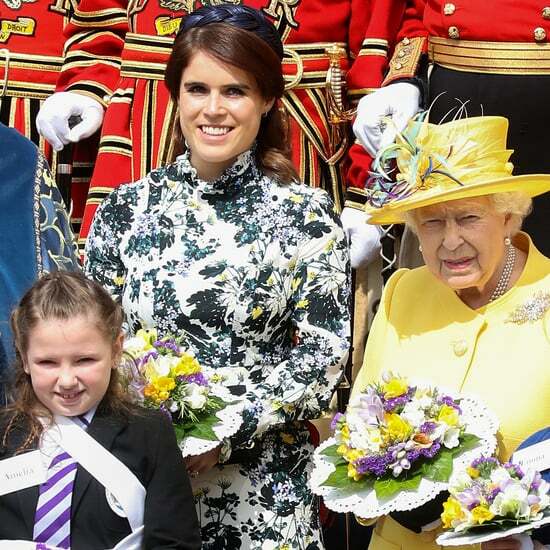 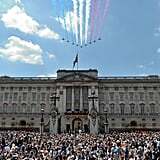 London spared the city from its usual rain for a lovely Trooping the Colour celebration on Saturday. 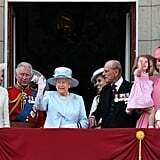 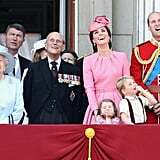 The annual parade — which was held in honor of Queen Elizabeth II's 91st birthday — featured some pretty cute moments from the royal family as they watched from a balcony at Buckingham Palace above the festivities. 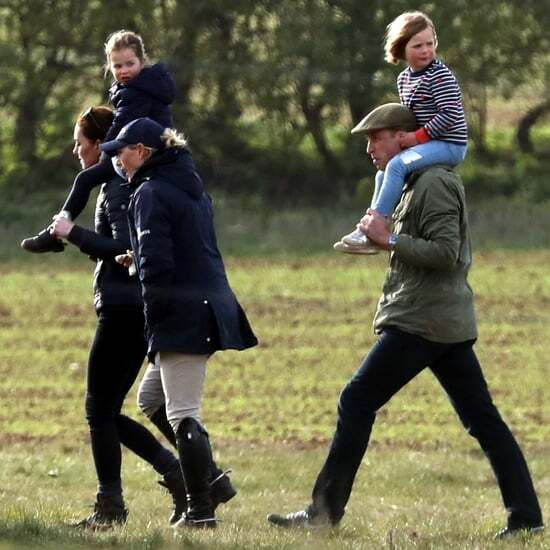 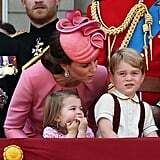 Along with the queen and her husband, Prince Philip, Prince William and Kate Middleton brought out their adorable kids, Prince George and Princess Charlotte, to enjoy the morning. 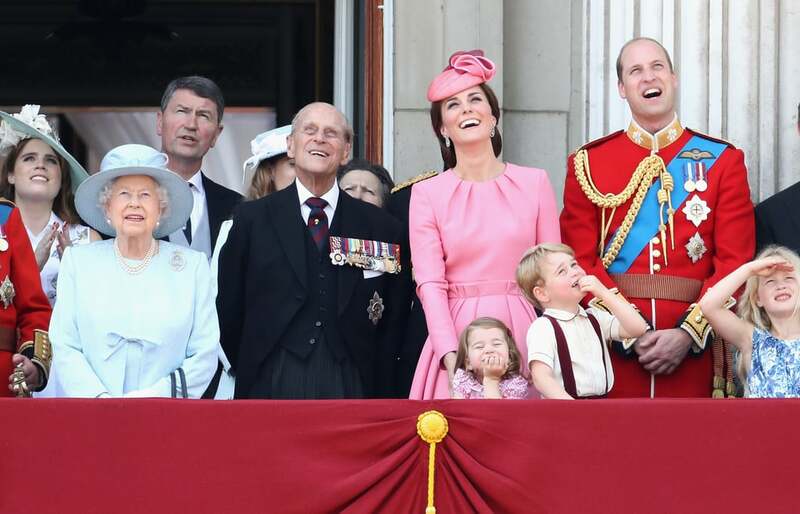 Princess Charlotte made her balcony debut in 2016, and her second appearance did not disappoint. 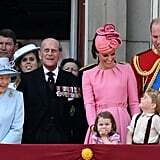 Dressed in the same shade of pink as her mom, she soaked it all in with some pretty hilarious facial expressions, which she no doubt picked up from her older brother. 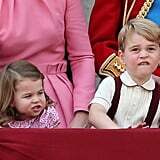 George (who was dressed in a supercute suspender outfit, naturally) continued his tradition of "over it" looks, but he couldn't help but get excited when jets from the Royal Air Force roared by overhead. 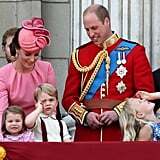 The littlest royals and their parents were also joined by Prince Harry, Duchess Camilla, Prince Charles, Prince Andrew, Prince Edward, Princess Beatrice, and Princess Eugenie. 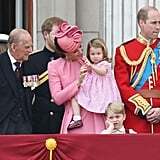 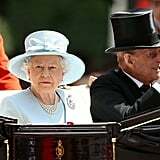 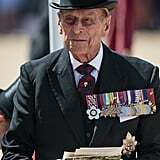 Trooping the Colour is always one of the royal family's most spectacular events of the year. 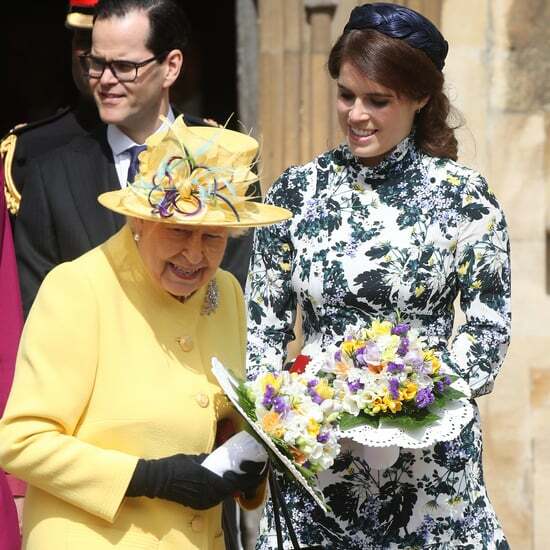 Although the queen's birthday is actually on April 21, the event is typically scheduled in June since there's a better chance the weather will be nice. 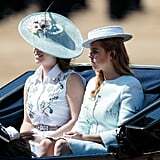 Kate and Camilla rode in a carriage together with Prince Harry, while Queen Elizabeth II and Prince Philip waved to the crowd from their own. 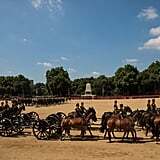 They were accompanied by more than 1,400 officers and 200 horses (one of which was ridden by Prince William!) 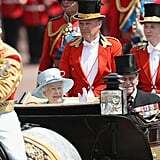 as the carriages made their way from Buckingham Palace across St. James's Park. 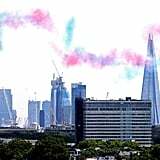 After the tragedies London has endured over the last few months, hopefully the day brought a smile to more than a few faces.